Head of Search and Discovery for Google Play, Ankit Jain, states: “For the average app, search actually makes up the vast majority of installs.” According to Jain, 12 percent of daily active users (DAU) search for apps every day, 50 percent of DAU search for apps weekly and Google sees six million unique phrases searched monthly. Another interesting note is that in the iOS App Store, no app ever stays in the same ranking spot all seven days of any given week. When you look at Google Play, you often find five or more apps maintaining the same top spots for over a week. Apple appears to be much more volatile in their top charts rankings, where the Play Store does not change ranks more than once a day, resulting in much more gradual trends. Find the best category for your app. Take a look at the competition in your current category and if your app can be put in another category, you may want to do that. App category placement is an essential aspect to ASO, as new or less-trendy categories are less crowded and thus likely to rank your app higher on their lists. Less common categories, such as Business, Travel, and Location-based or Work-related Services, for example, are likely to provide more opportunities for higher ranking and optimal app store placement, as these categories have shown lower review and download numbers at the time of writing. Driving installs will have the effect of a higher ranking for your game, which in turn drives more organic installs. This virtuous spiral of growth is a key goal, and burst campaigns which drive a high volume of installs at high velocity is one way to attain those top spots. Your app’s rating is one of the most important factors influencing its ranking in the Google Play lists and search results. It’s also one of the key metrics that the editorial staff looks for when curating apps and games. Jain says reviews and ratings are “a very strong signal for Google,” so maintaining an app rating average above 4.0 out of 5 is mission critical. Don’t be tempted to use fake reviews in Google Play and the iOS App Store, as the risk of getting your app flagged is extremely high. When it comes to reviews and ratings, Jain reveals that reviews are ordered based on relevance to the user, such as reviews from other users who have the same device or live in the same country. This means that personalized results exist, and if your friend in the network has installed and rated it, then it may appear on the first page of the Google Play Store only for you, so find a way to encourage a variety of people to review your app. The trick is to request a review from your users while they are deeply engaged in your app, while making sure you do not disrupt the UX. Google Play gets the keywords for an app from the app description. This field has 4,000 characters, so there is plenty of room to add your keywords. Keywords appearing within the name of an app itself usually allow the app to rank higher for those keywords. However, where Apple allows 50 characters in the app name field, Google only allows 30 characters. Therefore, you really need to choose the app name wisely in the Google Play store. MAKE SURE YOU INCLUDE A LINK TO THE APP ON ALL PAGES OF YOUR WEBSITE, BLOG, ETC. PUT THE LINK IN YOUR WEBSITE FOOTER. REACH OUT TO MEDIA OUTLETS OR ASK BLOGGERS TO WRITE ABOUT OR REVIEW YOUR APP. CROSS-PROMOTE THE APP WITHIN YOUR OTHER APPS OR THROUGH CROSS-PROMOTION NETWORKS LIKE THOSE OFFERED BY SUPREME MEDIA. One of the more obvious distinctions between the Apple App Store and the Google Play Store is the ability to +1 an app’s page on Google Play (similar to ‘liking’ a company on Facebook). This is one of the unique factors that influences an app’s ranking in the Play Store, and can be used by developers looking to increase ASO. New apps tend to have an easier time ranking and getting featured in Google Play than older apps. The logic for this is sound. Users want to try new apps and games. This is about giving new titles a chance. See this as the Play Store’s algorithm giving your app a little test to see if users actually like it. Likewise, apps that have been on the market for more than a month will find it very difficult to rank, unless their app is well-represented in the app store listing, with factors such as app title, description text, and social elements strong and steady. It’s still not entirely clear how Google Play calculates this, but it most likely involves a combination of active install rates and a stickiness formula such as DAU/MAU. Jain also revealed that Google takes into account statistics such as the rate of installs, uninstalls, long installs (an app that has been installed for months), and engagement, so it’s imperative to effectively re-engage with your current users in order to retain and retarget your established audience . Steady efforts work best. 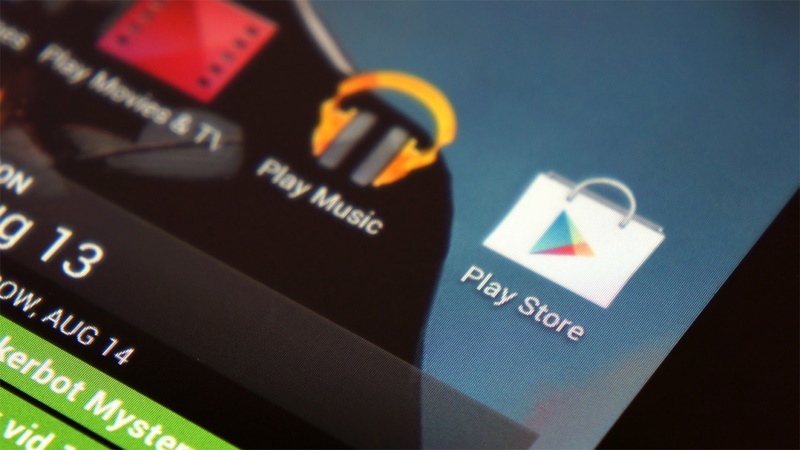 Google Play’s ranking algorithm is tilted towards long-term. Download growth over the last 30 days is more important than the latest 24 hours. Use closed loop marketing to ensure you are identifying and utilizing ad sources that bring loyal users – apps that acquire and retain satisfied users are rewarded with higher ranks. Advertising campaigns should be run over a longer term and sustained over two to three months, as opposed to the short bursts of activity often seen in the iOS market. With app store search accounting for more than 65% of all app downloads, search is clearly the leading source of app discovery. If someone searches using a leading keyword and taps on your app in the search results, your app will move higher in the rankings for that keyword search. As an example -­ if users are searching for flight tickets and click the most on Expedia, then Expedia will be the first result shown for “flight tickets” search queries. In order to best leverage search then, make sure to categorize your app with relevant keywords. Don’t overstep and stuff your description with popular and less applicable keywords dominated by huge apps with millions of downloads. Not only does Google Play penalize spam, but it’s not beneficial for your app to have it appear in the search of a popular but irrelevant keyword, where few users will actually click to download your app. Instead, focus on the edgy keywords that are more applicable to your app, that enjoy a respectable amount of traffic, and that provide low competition – ensuring a high CTR on search. After all, you’re looking for those who are most likely to actively engage with your app. Google Play continues to reap the lion’s share of global app downloads, as the store’s worldwide downloads were about 90% higher than on the iOS App Store in Q3 2015. Optimizing your app’s page in the Google Play Store isn’t optional, it’s critical. Perhaps most important is to always educate yourself on new ASO. 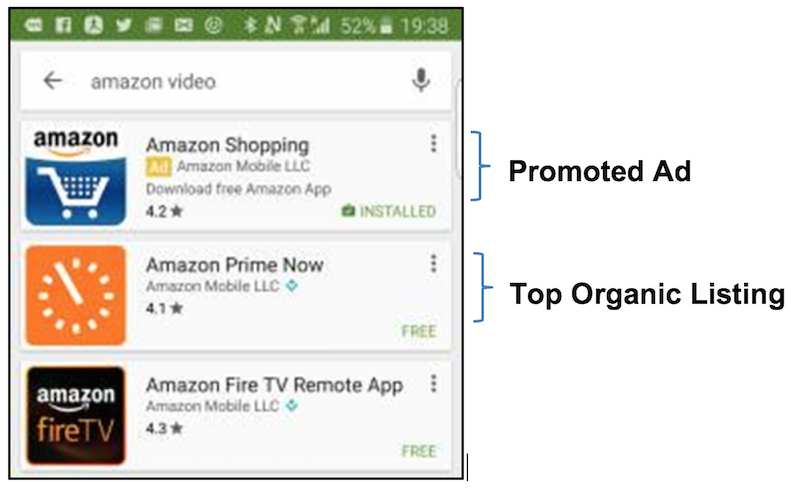 With app-store optimization constantly evolving, make sure you stay up to date on the latest techniques in order to improve your app’s rank. Last December brought in an astounding 9.2 million iOS app downloads, a 44 percent increase from the year before. App marketers anticipate yet another record-breaking season as they prepare their user acquisition campaigns for the upcoming holidays. But as downloads climb, so does the competition to garner them. Finding the right audience at the right price will be as challenging as it is rewarding. Here are six tips to help app marketers plan for the holiday user acquisition spree. Competition is fiercer than ever with nearly 4 million titles in the app stores combined. Get a head start by planning your user acquisition campaigns before December. Doing so will provide insight into looming holiday costs and allow time to adjust around KPIs and budget. If organic uplift is a key goal this holiday season — common with many new apps — plan for a media mix that favors volume. A burst strategy will help boost your app store rankings which in turn can lead to higher app discoverability and more organic downloads. During the cold season, users are more likely to spend from having increased leisure time and holiday money. App marketers should look to leverage this by structuring sustained campaigns around these high spenders. It’s a great time to target “whales” while re-engaging lapsed users to explore new seasonal content in your app. For both new and existing apps, plan to frequently evaluate organic growth to make adjustments to your bids. While mobile has generally been safe, the recent content blocking capabilities in iOS 9’s Safari are compromising its immunity. It’s not entirely clear what percentage of users will use this functionality, but it is reason enough to rethink the mobile web as a long-term user acquisition channel. Marketers with extensive budget tied into web should look to shift some budget to in-app — where publishers have more control over ad units and how they are displayed. Thanksgiving, Christmas Eve, and Christmas are some of the busiest days of the year for user acquisition. Consider a performance-based approach around these peak dates. Paying for performance will more than likely assure you see a return on each invested user. It may also help to map out your competitor’s planned bursts when planning your own. Although this information is not entirely accessible, observing other channels such as TV and web can give you some insight. For instance, a sudden increase in holiday TV commercials for a competitor’s game may indicate an impending burst campaign to complete the cross channel effort. A performance-based campaign here will ensure your budget is not diluted and maintains ROI. The holidays attract a wide and diverse range of mobile users. To capture all this period has to offer, avoid building overly-specific assumptions about your target audience. Over-targeting can limit your campaigns, and discovery of new, potentially more profitable user segments. Rather, explore broader targeting and let the data speak for itself — you may be surprised. Start by spending small while scaling only top-performing segments, ensuring you’re optimized in both revenue and new audience discovery. Imagine the install ad as part of your app’s onboarding process. If the experience is compelling, users will want to engage and learn more, perhaps even go on to install your app. For this reason, performance and brand advertisers count on video ads to deliver their message. Whether it is to encourage a quality install or communicate a strong brand message, the video format has an innate ability to engage users and promote action. It’s also an excellent format to brand with festive copy and visuals, helping guide users wrapped in holiday nostalgia to value your content over others. Video creatives take time to produce, so plan ahead and aim to have several options available before the Christmas rush. As always, A/B test and optimize for the highest conversion. 5. Do App Store Optimization aka ASO! There are two commonly overlooked components of your app store listing page that can increase your downloads — reviews and in-app purchases. The words that are in your app store reviews — those left by your users — and in-app purchases are all indexed by Google Play and iOS. Having targeted, relevant keywords in both areas will help you see a dramatic increase in downloads. 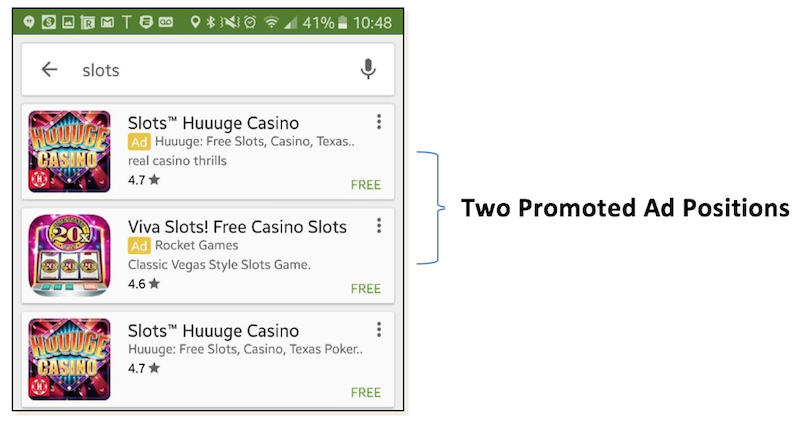 When it comes to promoted app ads, Google changed things in a big way a few weeks ago. We know that it is always trying to appease both the developer and the Android consumer and these changes are another push in that direction. The first big change is the addition of a second ad placement for non-branded searches in the Play Store (see below). Before the change, there was only one promoted ad at the top of the search and now two appear in the results. 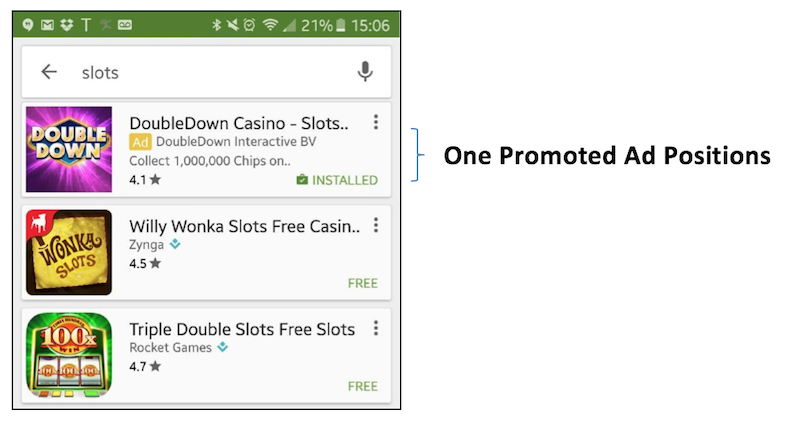 This gives advertisers more inventory in the Play Store and mirrors the number of placements advertisers have on Google.com. This is a slight blow to your non-brand App Store Optimization (ASO) efforts as you lose another spot to those with the budget for ads. The second and much bigger change Google made involves brand searches. Before we get to the implications, let’s check out the changes. You can see the big change is in the ad position, the brand term goes up and the paid ad moves down to the second position. Competitors seem to be winning the promoted ads for brand searches, meaning Google appears to be pushing (and suppressing those who own the first ad position) more competitor based searches. My assumption is Google expects to make up lost revenue from advertisers not having to pay for their own brand terms with this higher quality competitor traffic. So what should you do with these new changes? This inventory might come cheaper since Google is suppressing developer’s brand terms, so it might make sense as an evergreen strategy. Be very careful with these terms as they can get pricy for lack of relevancy. If you have another relevant app, leverage apps against each other to push competitors out. There is additional low funnel inventory in Google Play now. If you can spend more on keywords that are driving quality installs, you should see a better conversion rates. Did you see a drop in brand Android installs and quality from your SEM campaigns? You should get most of these installs for free from organic, but if you are buying search you are going to lose some quality from your channel from being pushed out of the auction. Why SEO For Mobile Apps (ASO) Is So Important?